Are you a lover of good wine? Are you looking for a way to make your wine tastier and full of flavor? This wine aerator by Senior Wine & Whiskey is just what you need. It is a simple wine aerating decanter that goes a long way to make your wine taste better. It makes use of a multi-stage aeration process to infuse air into wine, making the flavor and taste pop. You will love how your ordinary bottle of wine now tastes like an expensive bottle. It is also very easy to use. Simply pour your wine into your glass through this decanter. That is it. Cleaning your wine pourer is as easy as ABC. It has a detachable design which means you can take it apart for cleaning. You are therefore assured a highly hygienic product that will not harbor bacterial. It is also a nice gift for a wine lover, and it comes with a no-drip stand. Click 'Add to Cart' now and get yourself or a friend the best wine aerator in the market. You will love how good it makes your wines taste. MAKES EVERY GLASS OF WINE TASTE BETTER: Do you want to enhance the flavor of your bottle of wine? This wine decanter by Senior Wine&Whiskey does just that. It aerates the wine, making every glass taste like it's from an expensive bottle. We are confident you are going to like it. VERY EASY TO USE WINE AERATOR: We designed this wine aerator to be very easy to use. Getting a sweet glass of wine from this pourer is therefore as easy as simply pouring your wine through the decanter and into your glass. It also comes with a no-drip stand for when you are not using it. DETACHABLE FOR EASY CLEANING: We care about your health, and that is why we wanted to make our wine aerator very easy to clean. You can easily disassemble it for thorough cleaning, and reassemble it when you want to use it. 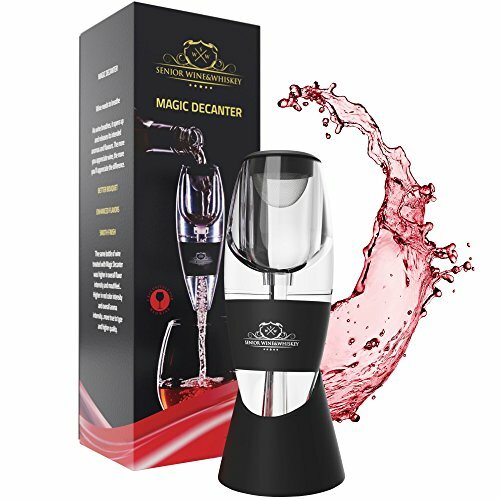 EMPLOYS A MULTI-STAGE AERATION PROCESS: Our wine pourer uses a patented multi-stage aeration process to infuse air bubbles into your wine and make it taste better. The process works very fast, and in seconds, you will have a nice glass ready to tickle your taste buds. MAKES AN IDEAL GIFT: Get this wine aerator decanter for a friend who loves wine. It is a nice and thoughtful gift that they will appreciate, and makes for a fancy bar tool. You also get a 100% money back guarantee with each purchase. Click 'Add to Cart' now! If you have any questions about this product by Senior Wine&Whiskey, contact us by completing and submitting the form below. If you are looking for a specif part number, please include it with your message.